Shalidor's Maze is a section of Labyrinthian. Its entrance is on the east side of Labyrinthian's outdoor ruin, on the ground level, just east of the mound-like structure containing the ruined dragon priest monument. Despite its name, it is not actually a maze, in that you cannot get lost in it as there are no intersections where you have to decide which way to turn. There is a novice-locked chest and large urn just outside the entrance. See Labyrinthian for full details of the surrounding ruin. You enter into a corridor descending a flight of stairs to the north. After a couple of turns, the corridor opens out into an open air courtyard with a large stone wall. There is an arch through the middle of the wall and stairways up to the top on either side of the courtyard. In front of the arc, there is a large flower bed and a tree growing on either side. This flower bed, along with more that are found around the courtyard and hanging from the walls and arches around the outside of the maze, contains plants that are listed in the table below. Taking either stairway leads to the top of the wall and provides a good view of the maze beyond the arch, also giving you access via Whirlwind Sprint to the top of the walls surrounding the maze and courtyard. These walls can also be reached by jumping behind the access-blocking rock on the western side. On the western wall, in an easily missed alcove, is an unlocked chest. The best way to find it is, after you pass the sloped part of the wall, walking under the first square arch and stopping just before the next one; the alcove will be on your left. 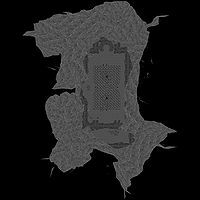 On the eastern wall, there is an alcove with a skeleton, a leveled weapon (up to Daedric in quality), and a random shield. The easiest way of reaching this is to continue around from the west wall, climb the peaked roof over the word wall and keep going. Passing beyond the arch is another courtyard with a raised circle. Atop the circle is a burnt corpse holding a filled soul gem and four smaller circles, each with a staff projected from them: a Fear, a Firebolts, a Magelight and a Repulsion, each representing a spell from the schools of Illusion, Destruction, Alteration and Restoration, respectively. On either side of this area are two more flower beds which each have a tree, as well plants, growing in them. Behind the staves is an archway to the start of the maze. You can walk all the way around the outside of the maze and reach the word wall at the other end of the maze, which teaches part of the Dismay shout. Entering the maze from the beginning, you pass two shutters that contain four loose coins and a random filled soul gem. The path heads north to a turning to the east; here, it is barred. To the right of the bars is a shutter that contains a scroll of magelight. There is a Sigil of Alteration on the north wall, which requires you to cast magelight to lower the bars. You can use a scroll, staff or spell to cast magelight; they all work. Follow the linear path through this part of the maze, opening the shutters as you go. Some of them hold items such as a loose coin or a flute, and some hold nothing. You will encounter a couple of Skeevers in this part of the maze. When you reach the end of the path, you will find the Sigil of Destruction, which requires you to cast firebolt or another targeted destruction spell. When you do, the floor will open and allow you to drop and continue onward. The shaft has three beams across it to help break your fall. Growing from these beams are hanging moss plants. Once you reach the bottom, the path continues to the south and enters a typical catacomb-styled area. At the crossroads, the path to the east is a dead end. The southern path ends in a shaft similar to the one you dropped down earlier, with beams across it and trap in the ceiling. Heading west leads towards a stone wall that rises as you approach to reveal a spiral staircase leading up and out of the maze on the west side, opposite a waterfall. Take the stairs and head north to the word wall and the second entrance. This end is blocked with bars the same as the first end; this time the wall close by is marked with the Sigil of Illusion, which requires the use of any targeted Illusion spell to open the way. You will find in the nearby shutters: a horker tusk, bloody rags, a piece of bent Dwemer scrap metal, an emerald, an amethyst and a garnet together, a Centurion dynamo core and a spell tome: Heal Other. You will encounter an Ice Wraith and two Skeevers. The Skeevers can be found already dead, killed by the Ice Wraith. You will also pass a dead skeleton that can be looted and a copy of the Conjuration skill book Liminal Bridges next to it. At the end of the path, the wall bears the Sigil of Restoration, which requires the use of a targeted restoration spell or use of the Staff of Repulsion. The drop beyond this barrier is to the shaft opposite where you landed last time. Directly ahead will be a sphere of magical energy blocking the way. However, as you approach the sphere, you will be teleported to a circular platform with a leveled Dremora who will raise a flame atronach and shoot firebolts at you. Fight the Dremora, and once he loses a certain amount of health, the player will be teleported back to the entrance to Shalidor's Maze, as if you entered the entire area again. The Dremora may or may not appear (depending on if you kill him in the magical sphere or not) in front of the character, but there will always be two leveled atronachs beyond the arch. Both will immediately attack. Once they are all defeated, don't forget to loot them both for their salts. If the Dremora appears as well, killing him will enable you to loot a Diadem of the Savant as well as a Daedra heart and random weapon. The Diadem reduces the magicka cost of all spells by 5%. If you want this item, it is recommended let him survive the earlier fight in the magical sphere. Alternately, if you kill him quickly during the Trial of Conjuration, just loot the diadem from his corpse there, then cast a conjuration spell on his corpse, like Banish Daedra to teleport yourself back out. If for whatever reason you do not wish to use the staves, it is possible to jump into the maze from the parapets on the sides; alternatively, simply casting the corresponding spells (if you have learned them) will suffice. Or, if you don't have a spell, there is a scroll in the shutters to the right of the Sigil of Alteration that will work. For a more in-depth guide on Shalidor's Maze, read the book A Minor Maze. The Diadem of the Savant can also be found on the wood chopping block outside Froki's Shack. If you are interested only in the Word of Power you can access it by going around the maze (either left or right). This location cannot be independently cleared. 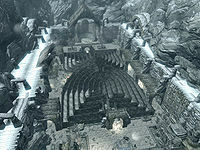 It is only shown as cleared because it is considered to be part of Labyrinthian, when the boss Draugr there has been killed. It never adds to your count of cleared locations, and therefore does not contribute to the Delver achievement. If you get caught in the peak while climbing the roof over the word wall, jump toward the north (rear) and you'll come out of it. Even though you are technically outside, the game won't let you fast travel while in the maze area in general, nor will the Call Dragon shout summon Odahviing. In the French, Italian, Spanish, German, Dutch, Russian, Polish and Japanese versions of the game, a bug prevents you from finishing the maze. Even if you cast the right spell on the right sigil, nothing happens. Change the game's language to English to bypass that bug. If the Dremora gets killed by your first hit (like with Devastating Blow perk), the Dremora won't teleport back to the maze entrance and you will get stuck in the Trial of Conjuration zone. Try attacking the Dremora corpse with a melee weapon. This can sometimes allow you to progress through the quest. Sometimes a sigil will not activate, or the Trial of Conjuration zone may not trigger. If this happens, try walking the maze again. Your follower may refuse to leave the area after completing the maze. If you dismiss them, they may not return home. Try fast traveling to a nearby location, and your follower should reappear when the game loads. You may move outside the labyrinth and use the console to move your follower to you (prid [follower's refID] followed by moveto player). They should then follow you around like normal. Dismissing and rehiring your follower may fix this. Followers may also remain stuck in the maze before completing it. This page was last modified on 28 January 2019, at 01:36.